A stray dog wanders into a high school's grounds. The dog, named Kuro, stays at the school and becomes a special friend to everyone. Ryosuke (Satoshi Tsumabuki) and Koji (Hirofumi Arai) are not only best friends, but also rivals in their love for Yukiko (Ayumi Ito). One day, soon before the upcoming university entrance exam, Koji passes away in a bike accident. Yukiko, who did not reciprocate his love, feels devastated, but Kuro helps heal her pain. Twelve years later, Ryosuke is now a vet and goes back to his hometown and meets Yukiko again. Ryosuke confesses his lasting feelings to her. Kuro has remained her pet, but is now very old and dies of an illness. Yukiko, who has had never gotten over the pain of Koji's death, faces Kuro's death and accepts it. This allows her to open herself to Ryosuke's feelings. Taking his hand, they begin a new life together. Sarah Sep 16 2008 1:37 pm I was in a college Japanese course when my teacher suggested the class watch Sayonara Kuro, since at my college we needed to have fifteen hours of Language Lab time, and I usually watched movies in Japanese to get my required hours. I finally checked out Sayonara Kuro and watched it. I didn't use subtitles for it so my understanding of the conversations was limited, but I found myself being magnetically attracted to the film. The film starts out in the setting of an old house that is inhabited by a mother, a father, their young girl and her puppy, Kuro, a black dog. They take good care of Kuro but one day they have to move, and can't take Kuro with them. Kuro waits a while for her owners to come back, but when they don't, she sets off to find somewhere else to stay since her house doesn't have food or water. A student of a nearby school finds her and from there Sayonara Kuro begins to unfold. I was interested in it when my teacher told me "it was a good movie, but sad", and at the start of the movie there's a song that plays during the time Kuro stays with her family up to the time she finally leaves and searches for a new place to live. It is Kuro's theme, I think, because it is repeatedly played throughout the movie and finally at the end when the credits are rolling. 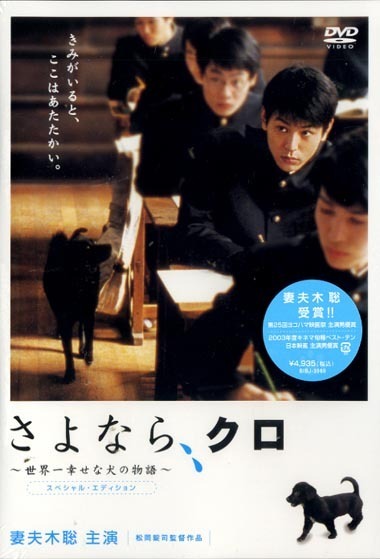 I enjoyed this movie because of the little peek into the life of several people: above all, Kuro, but Kuro's first family, several students at the school she winds up at, the school caretaker, a teacher--Kusama sensei--(who is afraid of dogs), and another teacher who likes Kuro but doesn't seem to know much about dogs. Kuro comes into contact with students and the other people I mentioned time again. Some of these encounters caused me to laugh, some to cry, but all were memorable (particularly the time when Kusama sensei is walking down a hall, discovers Kuro standing there, and tries to inch fearfully past her when she suddenly starts barking at him, causing him to fall down in shock). Kuro's silent way of reacting to situations made the movie enjoyable, especially if the situation is someone being afraid of her, or being friendly to her. Her calm demeanor and the demeanors of the humans she comes in contact with make for interesting (as well as a little sad) situations. Kuro seems to leave lasting impressions on whoever she meets, and has a penetrating, yet loving, comforting gaze. If anyone would like to see what Japanese daily life and culture is like, and enjoy movies about dogs, then this would be a good movie to either rent or buy. If, however, calm movies that have their own pace and are a bit sad (I'll admit I cried at one point or another nearly all the times I watched Sayonara Kuro) then it might not be a good choice. There isn't much action or adventure in the movie--it is a real life movie with real life situations, people, and animals, but personally I enjoyed the movie very much.